Who wouldn't love this basket! It is beyond pretty, it is GORGEOUS! It also includes a wonderful hardwood serving tray that they will absolutely treasure!! Not to mention all of the wonderful gifts and goodies tucked inside, such as an incredibly beautiful autumn candle set!! This glowing breakfast gift basket includes: -A Beautiful Wooden Breakfast Tray with Embossed Brass Details, -Stunning Gift Box Set Of 8 Fall Leaf Candles In Rich Metallic Autumn Colors, -Apple Cider Glazed Fritter Mix in Charming Old Fashioned Gift Box, -Caramel Apple Butter, -Cinnamon Apple Topping For Breakfast and Dessert in Old-fashioned Canning Jar, -Pecan Praline Syrup, -Pecan Nougat Roll, -Glazed Georgia Pecans, -White Chocolate Caramel Pecan Gopher Turtle, -Pumpkin Pie Flavored Coffee, -Pecan Bar Flavored Coffee, -Caramel Apple Flavored Gourmet Coffee. They say breakfast is the most important meal of the day so sending a breakfast gift basket is a sure way to get someone's day started off right. A unique and stunning gift! A breakfast gift basket never looked so good! This fall breakfast gift is truly a treasure to receive and the durable wooden tray will last for years afterwards. 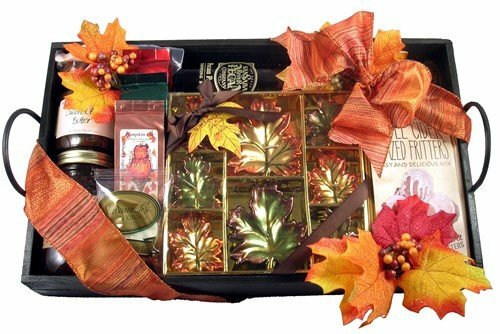 Makes a beautiful holiday gift, Thanksgiving gift, office gift basket, birthday gift basket, or thank you gift basket!